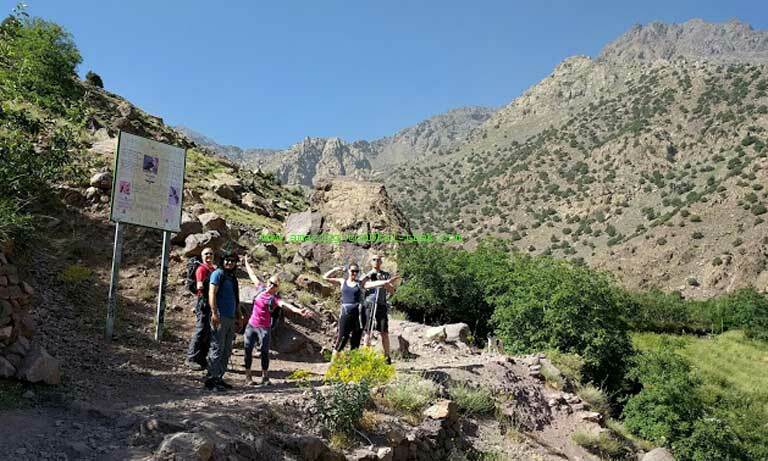 Toubkal desert combined tour: The best trip we recommend to our guests a combination of two different part of Morocco, Toubkal, and Sahara desert. So the first part which trekking in the Atlas Mountains is an adventurous part and the second part – Ride a camel through the Desert and discover its majestic beauty. The first section of the adventure includes the Toubkal ascent, and the second part is the Sahara trip with desert night camping. 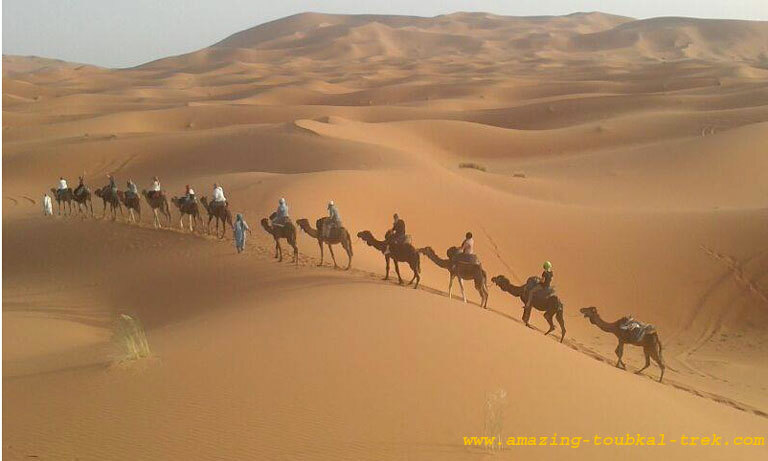 – Experience the desert Berber camp. You’ll drive from Marrakech to Imlil and then trek to Toubkal Refuge via Mizane Valley. We walk towards the village of Aremd and then the shrine of Sidi Chamarouch. As we continue east and cross the flood plain, our route takes us along the mule tracks and into the high rocky cliffs. From here, the trail continues with a steady climb, zigzagging and snaking its way up to the snowline and the Refuge. Overnight in the Refuge. Approx 5hrs of walking. We trek to the summit of Jebel Toubkal (4,165m). We make an attempt on the Jebel Toubkal summit – the highest peak in North Africa. Our route takes us to the south cirque, crossing the stream above the refuge and then heading towards one of the mountains’ numerous screen fields. The walking is relatively straightforward, but the altitude and screen seem to be an impediment. However, the views along the way will make the journey worthwhile. Cresting the ridgeline, we’ll find ourselves on the plateau, from where it’s a short walk to the summit. The vistas across the surrounding landscape are also breathtaking. From here, there’s an open view in every direction, right from the Marrakesh Plain to the northern High Atlas and the Anti-Atlas. Retracing our steps, we’ll descend the mountain and head back towards Imlil where we spend the night in a local Guesthouse. We’ll travel along the Ounilla Valley to the Telouet Kasbah, a crumbling kasbah that was once an important station for traders. After the exploration of the Kasbah and then after lunch, you will head back over the Tizi-n-Tichka Pass to Marrakech (4 hours drive). – The Toubkal desert combined tour is available and can be arranged for groups of all sizes. 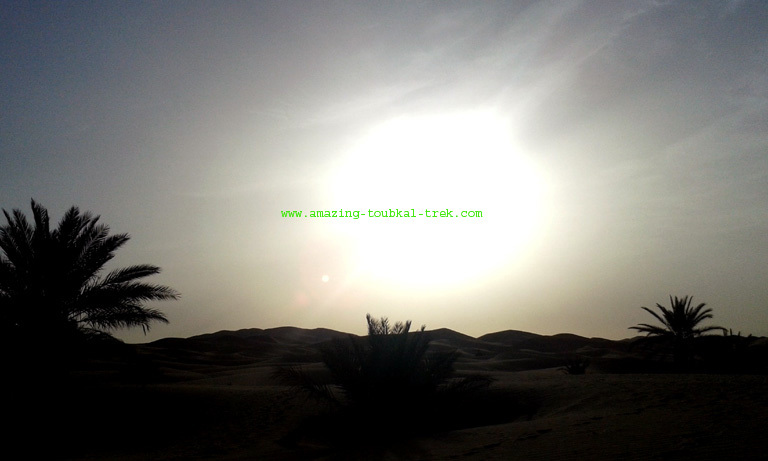 Toubkal desert combined tour: A private trip to reach the highest peak in North Africa and the highest dune of Merzouga. Toubkal Ascent and Sahara Trip, Combined Toubkal and Sahara Trek.